They have a touch so feathery light it can be barely felt on human skin. The vivid gold and black colored golden orb weaver spider is the largest webmaking spider on the planet. These incredibly efficient arachnids can weave a web up to three feet wide in less than an hour. And these spiders’ silk spinning abilities could have far reaching implications for both science and medicine. Scientist Randy Lewis shows how their silk can be used for many different purposes. But first he teaches about the spiders in his laboratory—all unique in size, but the one thing they have in common is that they are all females. On this journey the reader will learn about spider goats, silk milk, and potential spider silk products like space suits and surgical sutures. Silkworm production for getting silk and the different types of silk made by different spiders are fascinating subtopics. The reader will also learn about DNA and genetics in a simplified way, and though the information is dense, it is broken down into digestible morsels. Overall, this 80-page nonfiction book informs about real progress that scientists are making in producing silk to use in our lives and in medicine. 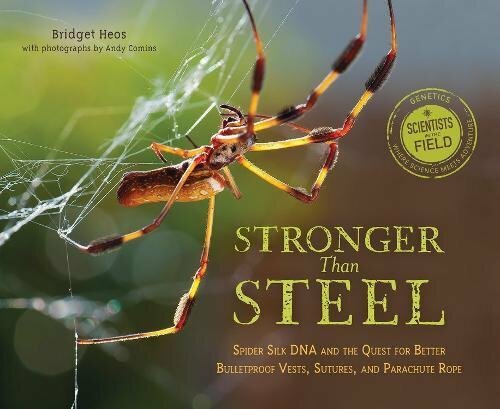 This Scientist in the Field Series covers many animals such as elephants, polar bears, frogs, horses, and tarantulas, as well as deepsea volcanoes, hidden worlds, and extreme scientists. Children ages 10 and up who love science and learning more about the world will enjoy the series. There is a glossary in the back of the book to help with terminology, and plenty of photographs and pictures.